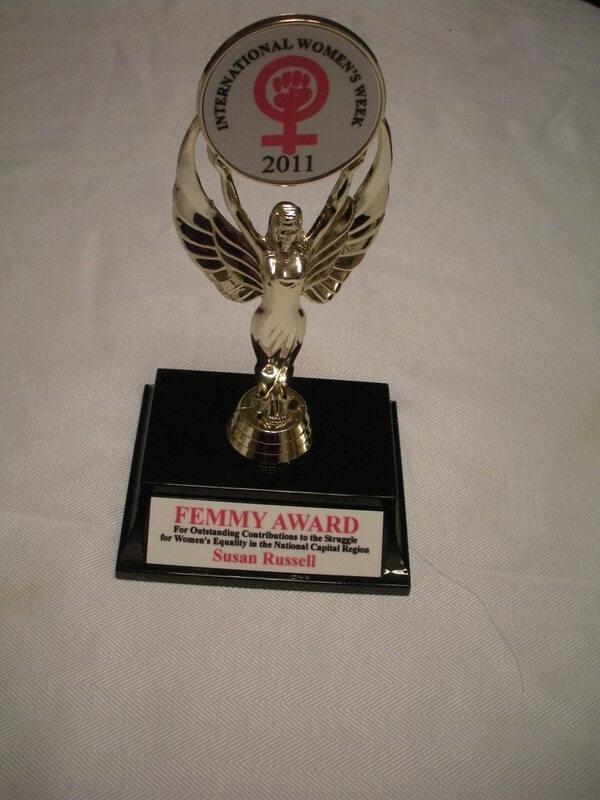 OTTAWA, March 9, 2011 – Susan Russell, who served as the Executive Director for CFUW’s National Office for over 11 years, was honoured with a “Femmy” award for her years of feminist activism. Russell received her “Femmy” last night at Ottawa’s annual International Women’s Day celebration. 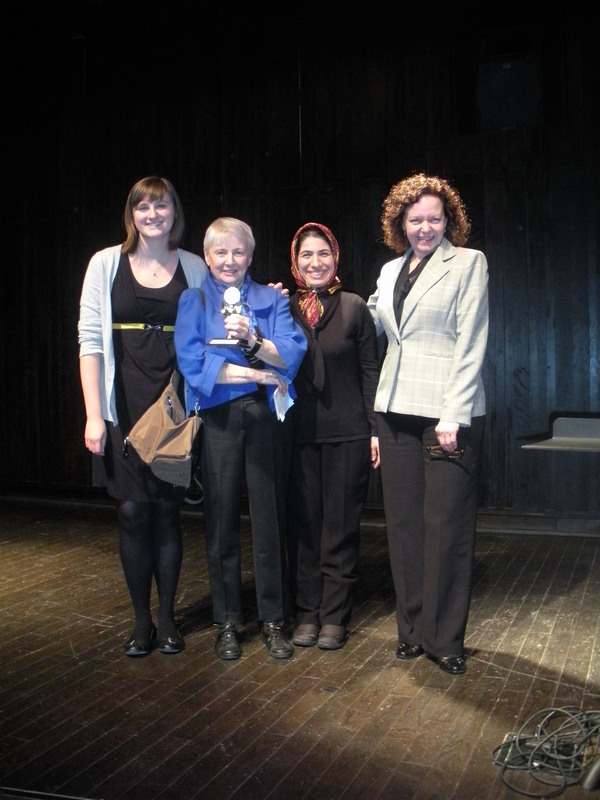 Russell has been a tireless advocate for the rights of women in Canada and abroad. During her term as Executive Director, she leveraged the collective power of the Canadian Federation of University Women to lobby for a Canadian foreign policy that recognized the distinct situation of women in situations of conflict and disaster. As a member of the Ad Hoc Coalition, she contributed her expertise and her time to ensuring that women’s voices were part of democratic debate in Canada. A special mention was made for Russell’s commitment to mentoring younger women – her friendship, advice and support is always given with selfless generosity. Women of all ages, from different backgrounds and experiences have all found encouragement, camaraderie and a mentor in Russell. The event, celebrating 100 years of International Women’s Day, was the perfect venue to honour Russell’s dedication and fierce passion for gender equality and human rights. This entry was posted in Actions and tagged celebration, Femmy, IWD, Susan Russell on March 9, 2011 by cfuwadvocacy. For many Canadian and Western women; free, educated and affluent are not words that could describe their experience. The stats confirm what women can tell you themselves; inequality is real. Wente claims we are free, while so many are still abused and raped. Canadian women are 4 times more likely to be murdered by their partner than men, and our Aboriginal sisters continue to go missing and are killed without outrage or action. Wente argues we are educated, but ignores the barriers to access education. Young people from the poorest 20% of Canadian families are less than half as likely to enrol in university as the richest 20%, and for aboriginal children who have $3000/student less in funding for basic education than non-aboriginal kids, Wente’s argument could not be further from the truth. For affluent women, equality has always been closer to their reach. For women who enjoy that privilege of economic independence and stability, life is not so bad. However, Wente has blinded herself to the economic disparity that has deepened over the last thirty years in this country. Women are the new face of poverty; single parent homes headed by women face high poverty rates, in part due to more unstable and underpaid part-time work and lack of access to affordable housing. Wente’s article has a point; for women who are free, educated and affluent, equality and opportunity have never been better. But that leaves one question to be asked… who are these women? Because a lot of us have been left out. This entry was posted in Actions, Information and tagged equality, IWD, reality check on March 8, 2011 by cfuwadvocacy. As we share the 100th anniversary of International Women’s Day across the country with our friends and members of CFUW let’s take time to celebrate, recognize past efforts and take up the challenge to continue to work for the rights of women while protecting the gains we have made. We have a right to expect freedom from violence in our lives, economic security, personal safety and access to health and education services. These are the things that CFUW stands for and works for all year long but especially during International Women’s Week. Let us work together for peace, equality and understanding as we celebrate in our communities. Whether you raise money to educate a young woman, help with a community centre or promote the arts, enjoy this week and celebrate your achievements with like-minded women. This entry was posted in Information and tagged 100th anniversary, IWD on March 8, 2011 by cfuwadvocacy.